Andrea Oke is a Somerset based artist whose work focuses upon the preservation of memories. In May 2017 Andrea was selected to take part in Muse:Makers in Museums and will spend the summer working with the volunteers and in Axbridge Museum. Much of this project will involve local engagement and Andrea will be working with local schools, community groups and once a month at the Axbridge farmers market. If you are part of a local community group or association in the Axbridge and District Museum catchment area and would be interested in taking part in a workshop please get in touch via the Contact page. 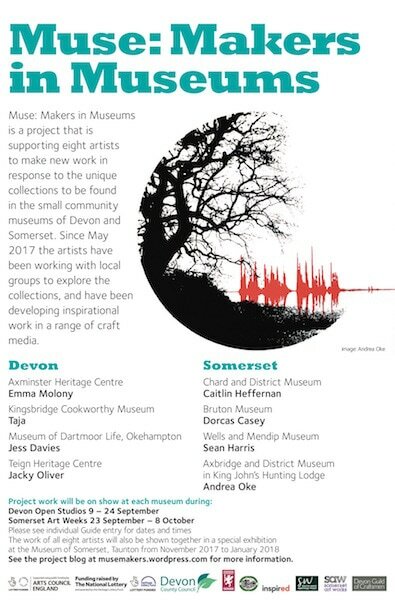 Muse: Makers in Museums is a project that is supporting eight artists to make new work in response to the unique collections to be found in the small community museums of Devon and Somerset. Since May 2017 the artists have been working with local groups to explore the collections, and have been developing inspirational work in a range of craft media.